REDMOND, Ore. — Northwest home builder Hayden Homes, nonprofit First Story, the City of Medford, Ore., and numerous other partners recently came together to rebuild the 42-year-old home of William Verschoor, a veteran who fought in the Vietnam War. Verschoor voluntarily enlisted in the Army and was stationed at Dong Ha from 1968 to 1970 as a field soldier and tank mechanic. A local neighbor contacted the City of Medford about the condition of the veteran’s home. A tree had fallen and severely damaged the roof, and upon further inspection, missing floor section were discovered and the home had no insulation, heat, or running water. The home was deemed uninhabitable by the building department. The City of Medford reached out to a local builder, Hayden Homes, and asked the builder to partner with the City to construct a new home for Verschoor. The City of Medford waived all fees associated with the project, including permitting, inspection, and timeline. Hayden Homes oversaw the construction management of the home and worked with its nonprofit, First Story, which helps deserving individuals and families in need achieve homeownership. Hayden Homes also coordinated with additional partners to secure the necessary services and materials to rebuild the home, including excavation, foundation, plumbing, paint, and lumber. Keys to the completed home were presented in a special dedication to the deserving veteran at a ceremony where he was honored and welcomed into his new home by the community, neighbors, and numerous partners. 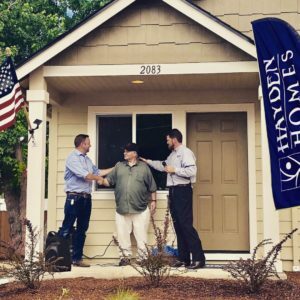 Hayden Homes provides new homes to hardworking families throughout Oregon, Washington and Idaho. Established in Redmond, Oregon in 1989, Hayden Homes has built more than 14,000 homes in over 300 new home communities. Hayden Homes continues to be the largest privately owned new home builder in the Pacific Northwest. With a commitment to building strong communities together, Hayden Homes has contributed 2.5 billion dollars to local economies and creates more than 5500 jobs annually. Hayden Homes supports philanthropic efforts in the communities in which they build and have contributed more than 13.3 million dollars in charitable donations with the flagship of their giving through the 501C3 Non-Profit, First Story. To date, First Story has provided 69 work-force families throughout the Pacific Northwest with an affordable home ownership opportunity and a first step toward financial freedom. The Hayden Homes brand family of companies includes Simplicity by Hayden Homes, Wise Size Homes and Hayden Homes, all providing an unparalleled selection of opportunities for those looking to purchase in a new home community in Central Oregon. First Story is a 501(c)(3) non-profit organization committed to providing affordable home ownership opportunities to deserving families throughout Oregon, Washington and Idaho. Founded in Redmond, Oregon in 1998, First Story has helped more than 10,000 families through new home construction and financial support. For more information visit: www.FirstStory.org.